THESE PROGRAMS ARE SOLD OUT! THANK YOU FOR YOUR INTEREST AND SUPPORT! 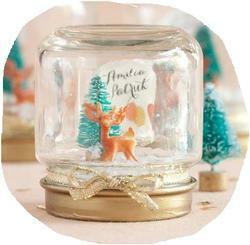 Use your imagination and create a winter wonderland in a jar! During this winter break workshop children will learn how to make their very own snow globes using glass jars, miniature figures, and, of course, glitter! This program is suitable for children age 7 to 11. All children must be accompanied by a parent or guardian for the duration of the program, which will last approximately one hour. The $5 fee covers the cost of craft materials. Participants will create a snow globe to take home. Seating a the craft table is limited, and preregistration is required. The program fee also includes admission to the Society's 43rd Annual Holiday Exhibition, "Cherished & Charming: Small Houses and Tiny Treasures." Or using a credit card by calling(845) 634-9629. Cancellation policy: Refunds will be given only if space can be filled by another guest prior to the event. A waiting list will be compiled, and available spaces will be filled on a first come, first served basis. Only those who have made full payment can be accommodated. If the event is canceled by the HSRC for any reason, all program fees will be fully refunded.